Edward and Georgia Bennett of Bennett Images were privileged to witness the spring migration of the caribou as they crossed the Kongakut River in Alaska's Arctic National Wildlife Refuge. 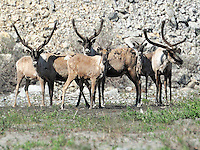 They also spotted a long caribou in late summer along the Marsh Fork of the Canning River, also in ANWR. Then, in summer 2010, they were privileged to watch hundreds of caribou from the Porcupine Caribou Herd cross the Hulahula River, both in the canyon and where the river empties into the Arctic Coastal Plain.